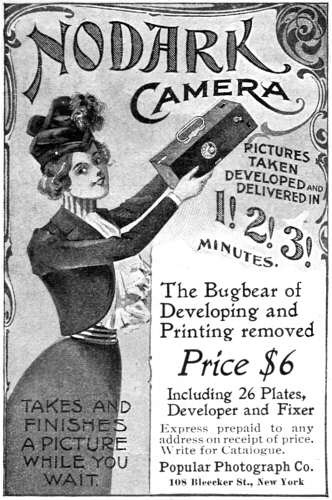 Nodark Camera advertisements always portrayed a simple camera that could deliver finished pictures in minutes. The camera was also characterized as "clean, complete, and convenient" -- something amateur photographers would find very appealing. Of the many Nodark references, this little known image is my favorite. A delightful portrait of a well dressed Victorian woman proudly holding a Nodark in the air graces the advertisement. The woman's gay attitude and neat attire supports an advertising theme that the camera was indeed convenient, clean, and easy to use. Not surprisingly, the (messy) developing tank never appears in the ads. Another interesting aspect of Nodark advertising is the variety of company addresses listed. While nearly all advertisements referenced "Bleeker Street," the building number was often different (e.g. 108, 114 and 116, 112 and 114, and so forth). Unusual? Not really. This was a common practice because it provided a simple way to track advertising effectiveness. For example, this particular advertisement is from a 1900 issue of the Ladies Home Journal. Therefore it was easy to determine that customer inquiries to "108 Bleeker Street" came from the LHJ publication.